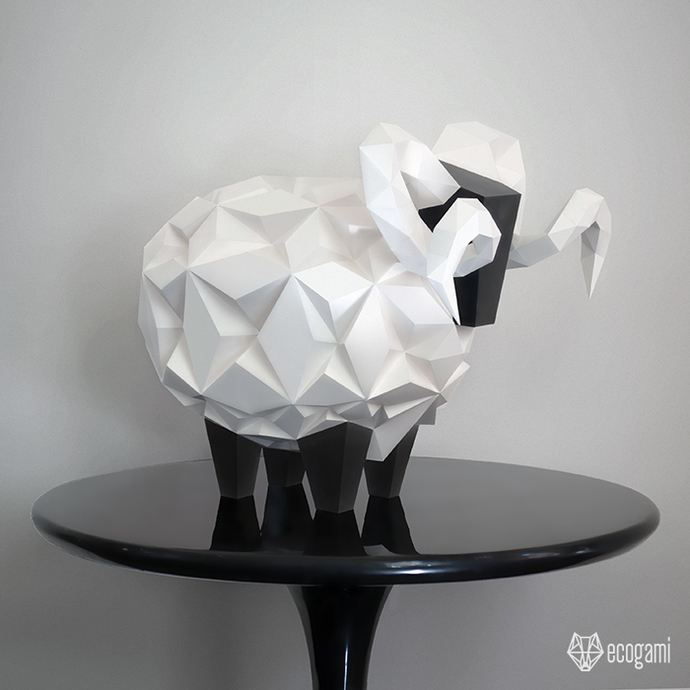 Make your own papercraft sheep sculpture with our printable PDF template! Follow the instructions & you will be proud of your farm animal. Isn’t it a nice & unique paper object to decorate your sweet home? This model comes in four versions: The ram or the ewe with an embossed coat. I don’t recommend those models if you are a beginner. The ram or the ewe with a low poly coat. The low poly ram has a medium difficulty level as it has small parts to make the horns. The ewe is easy to assemble and perfect if you are a beginner. I assembled the sculptures so everybody can do it! You will just need time & precision. Put your music on & enjoy the assemblage! (For me it is a perfect way to relax). ► Once purchased, download the ZIP file with the patterns (PDF files to be printed with A4 or A3 sheets – Letter or Tabloid in the States) & the complete instructions in English to make the sculptures. ► Print the template (choose the model you want to make (Hard or easy - Ram or ewe) and the sheet format which is more convenient for you, the size of the sculpture is the same with A3 or A4 paper). The paper must be thick (200 / 300 GSM / grams per square meters). The one I use is 270 GSM & it is perfect for that kind of sculpture. You can print at home if you have a printer or, easier, go to the nearest Print shop, you could buy the paper & print there. ► You printed one of the patterns! Now just check you have the following tools: a pair of scissors, a ruler, white paper glue and a tool to fold the paper (could be a scoring tool / cutter pencil or even a small knife). You are ready to begin! ► Difficulty Level: The ram & the ewe with an embossed coat are difficult to make and I recommend those models only if you already have an experience in that kind of creation. The ram & the ewe with low poly / flat coat are easier to make, you can make them even if you are a beginner. The size of the ewe is a little bit smaller.